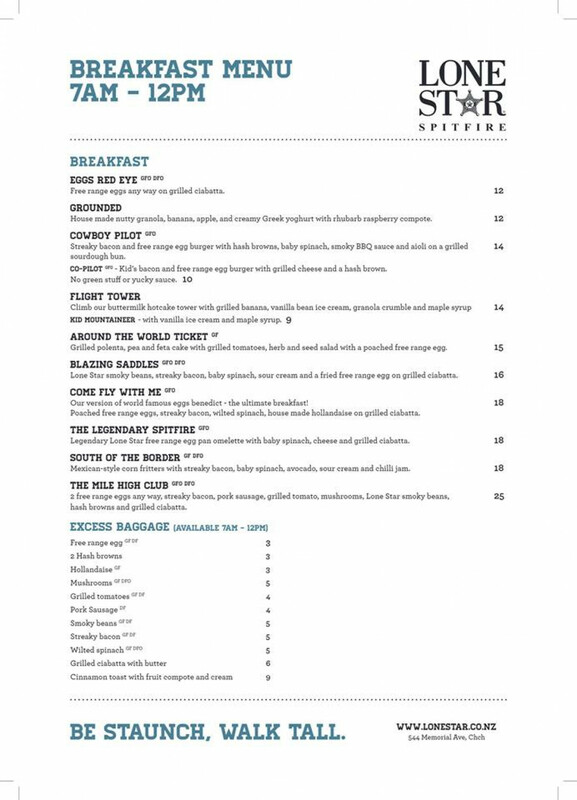 Welcome to Lone Star Spitfire, the newest addition to New Zealand’s much-loved restaurant family! 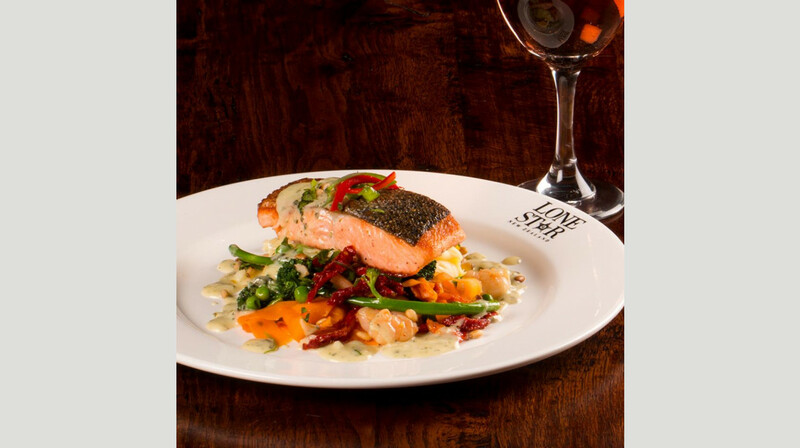 Renowned for their superb staff and vibrant atmosphere, this is a fantastic place to wine and dine. 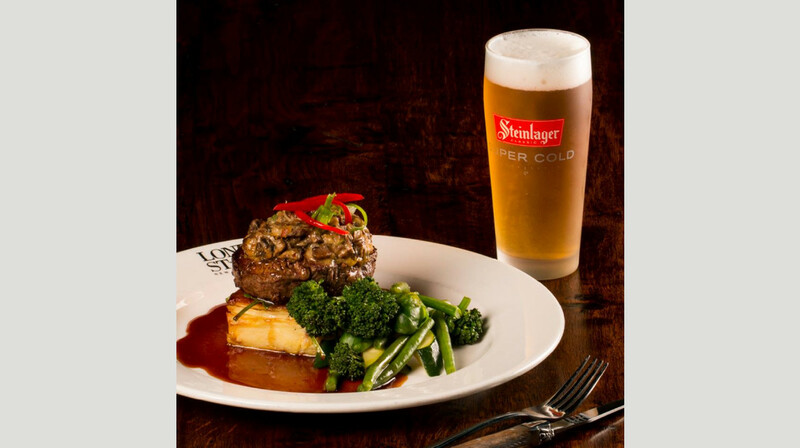 Choose from mouthwatering steaks, burgers and ribs, or go for one of New Zealand’s finest meats, like the slow-roasted lamb shoulder. 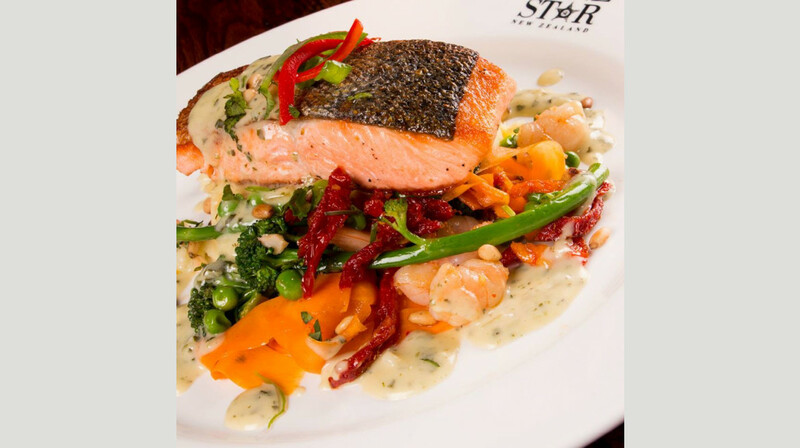 From fresh seafood and free-range chicken, to vegetarian and gluten-free dishes, there’s something for everyone at Lone Star! A kids menu is also available. Relax inside their rustic restaurant, or catch the sun on the outdoor courtyard. For the sports fans, there’s a mega 75-inch screen in the bar, so you can get all the latest highlights. Located at Spitfire Square in Christchurch Airport retail park, this is a relaxing setting for dinner before your flight. Free wifi is also available. 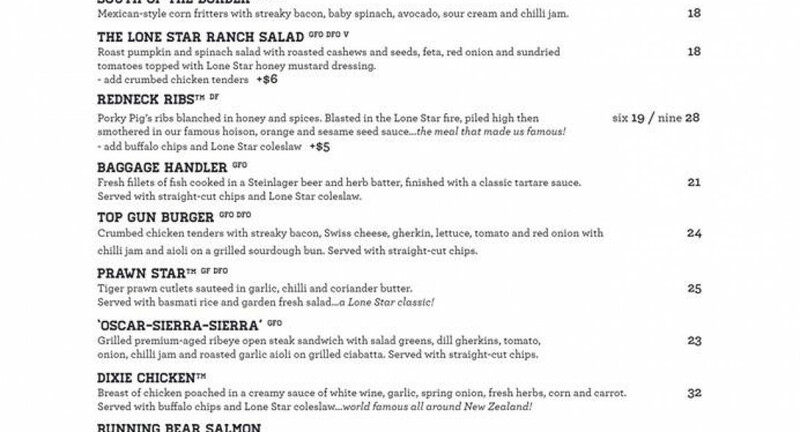 Lone star is a NZ favourite. If you’ve not been recently you must return ASAP. We shared entrees, the bean dip is delicious, and you cannot go past the calamari. My husband had the Honky Tonk chicken classic size. This is the first meal I’ve ever seen that he couldn’t finish. This was more a good quality pub meal which is exactly what he wanted. I went for the venison Denver which was faultless. 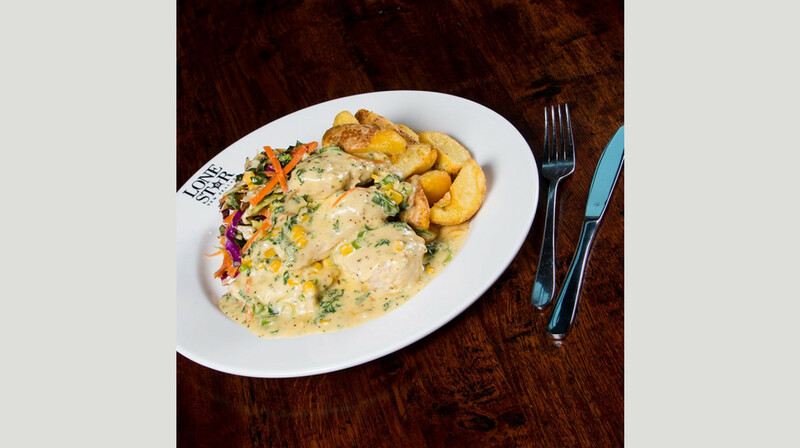 The Lone Star caters for both simple hearty tastes as well as finer restaurant quality meals so it’s great for the entire family. The staff are friendly and attentive, and the atmosphere was buzzing. Highly recommend Lone Star as a regular. Food looked and tasted really amazing. The only concern about service was that waiter didnt offer or bring us tapped water. Overall, it i would recommend this place. We have just had our second lunch at Lonestar Spitfire, and enjoyed it just as much as the first time. Sometimes an experience the second time doesn't quite match your memory of the first time, but this one certainly did, and we look forward to a third. We were made very welcome from the time we first arrived, throughout the dining experience. The service was good, our waitress kept coming back to us to see if everything was satisfactory. We loved the actual restaurant, new and open, having the indoor-outdoor flow was great, especially on a hot evening, which it was. We will certainly be back! All staff involved were great and our meals were very nice. Thanks to you all. Yummy food and friendly service. Excellent meal, drinks and service, we will definately be back. Celebrating my husband’s 75 thBirthday with our Daughter and Grandchildren, we all had a Great time ,the food was fabulous ,service couldn’t have been better! 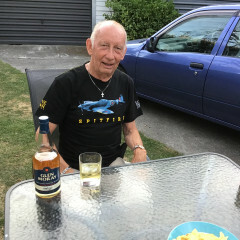 My husband was highly delighted when we realised Birthday People can have a ‘Spitfire ‘ teashirt as a pressie,he is a great Spitfire fan so it made his night Thank you ! Lovely atmosphere, friendly staff & food was so yummy. Very generous servings as well! Great Breakfast. Meal was huge, fresh and served up pretty quickly. Will be back for sure. Wonderful meal. Fast service, huge portions and yummy food! Highly recommend. The food was delicious and serving was huge. The girls kept checking on us to make sure all was going well. My wife and friend loved the food and so did I. Will definately go back. Great experience great service from arrival throughout our visit tasty dishes . Great food! We had ribs and filet. Both were really good!! 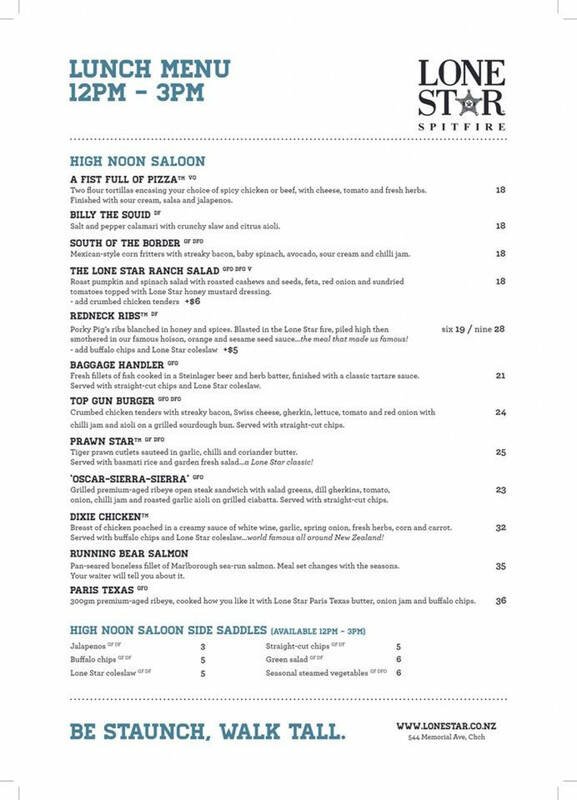 We had a great dining experience and would definitely recommend Lone Star Spitfire to other people. It’s always daunting taking young kids out to a proper restaurant but thankfully it all went without any fault. Food was fantastic, prompt and affordable. Staff were pleasant. Fantastic time using first table for the first time. First time dining at Spitfire, fantastic services, fantastic meals! Great service! staff were so friendly and accommodating despite being really busy. They let us know that they were expecting some large groups in so we were prepared for any delays I thought, but everything arrived promptly and was perfectly cooked and presented. Cant wait to come back! 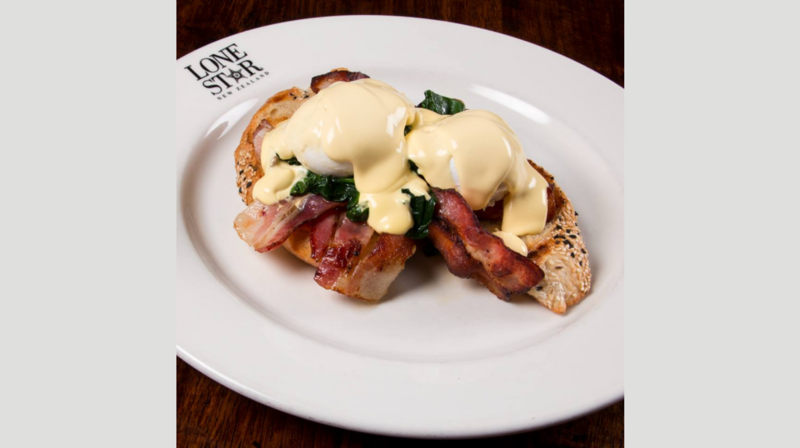 I can absolutely recommend Lone Star Spitfire for a great breakfast experience. It wasn't busy, so we didn't feel rushed at all. The service was great and the meals were all amazing (and large! ); even the coffee was good. Our two teenagers were also very impressed. We'll be back for sure! Food was very nice and the service was good and friendly. The meals were of a generous size and very tasty. 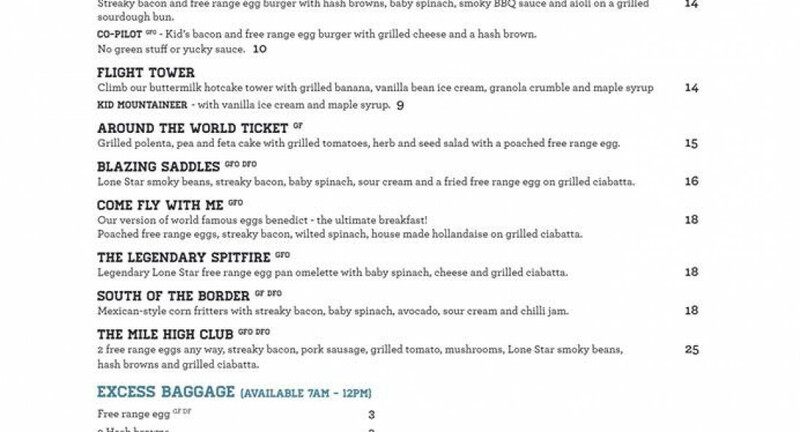 As I understand it this is the first Lone Star to have a breakfast menu - when we went there were only two tables booked which detracted a bit in terms of atmosphere, but that's just a comment not a criticism. Absolutely loved it, the food was magnificent & the service was terrific. 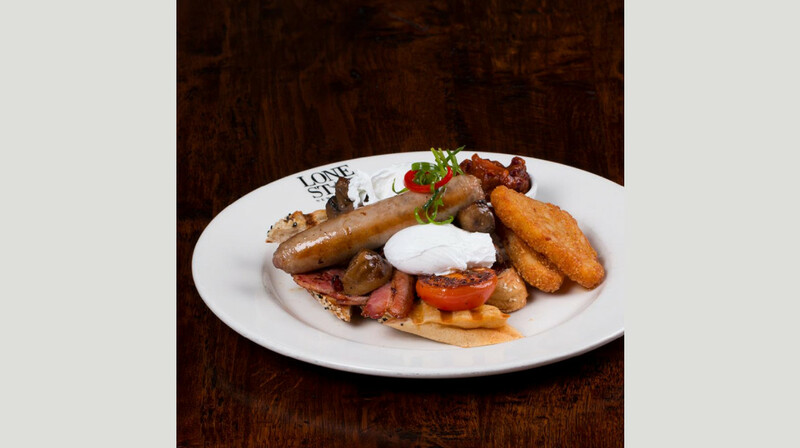 Best big breakfast in Christchurch! If you haven't been there yet but love a beautiful morning or watch sport on the big screen while eating, try it! Great food and great service. Restaurant was very clean and we all had a great time. Thank You. 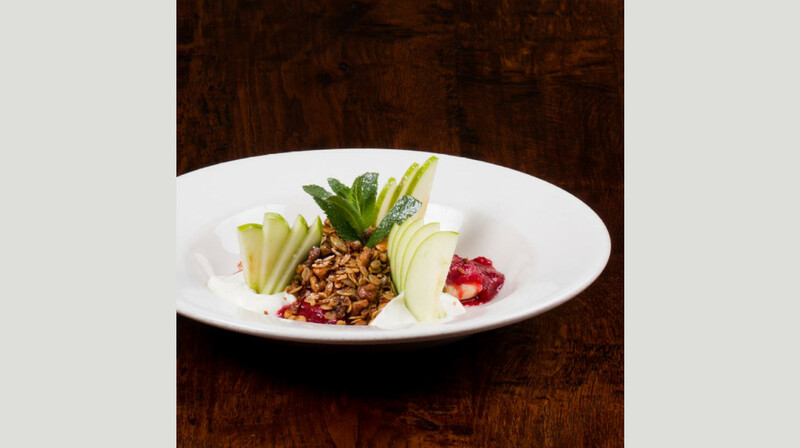 Amazing food from an incredible menu selection. Generous servings. 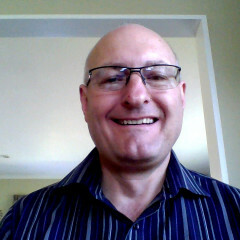 The staff are fantastic, friendly and fast without being intrusive. Service was excellent. Definitely 5 stars!!!!! First time at this venue and will definitely be going back. Atmosphere lovely, service great, food wonderful - will be bringing friends with us next time. My wife and I were looking forward to this "date" as it was the first time we have been out since our daughter was born, and the first time we have been to Lonestar. Unfortunately we were disappointed with our choice of restaurant. I ordered the ribeye steak that was way over cooked, asked for medium rare, no pink what so ever. My wife ordered the salmon which she said was lovely except the salad wasn't fresh and the lettuce brown. At no stage were we asked how our meal was, not while eating, not when the plates were cleared and not even when paying. We didn't bother staying for dessert. Not somewhere we would recommend, we won't be returning. Food is good, substantial & generous portions. In true Lone Star style restaurant is incredibly noisy. The food was great value and very tasty. We were disappointed that the lunch menu was really paired back. There was only one starter and that came out at the exact same time as the main meals. Couldn’t fault the staff. They were very friendly and efficient. Entree was good we had the load and squid , main was also good we had chicken and beef burger , my other friend ordered ribs , the only thing is that the table was too small for 3 and we keep having to shuffle things around to be comfortable , overall i will recommend Lonstar to all my friends.